During our trip to northern and western Iceland, we took a day trip to hike along the Búðahraun lava field, an eight-thousand-year-old expanse of basalt covered in endemic mosses, lichens, native willow, and other delicate and protected species. We followed an old trail which was forged by horses and farmers traveling between towns along the south shore of the Snaefelsness Peninsula. Parts of the trail faded away in spots, and the way was marked only by piles of rocks called cairns, indicating the direction to continue where the trail faded out. We got lucky with the weather, and our hike was perfectly clear and sunny, one of the best days we have had during our dark, frozen winter in Iceland so far. Our hike took us along the coast for about a mile, before veering towards a funny looking mountain in the middle of the lava field. Sticking out starkly above the flat ground around it, the mountain was shaped like a half dome and covered in bright green moss. It was the shield volcano that produced the field of basalt we were walking over. Shield volcanoes are low-lying, rounded volcanoes that produce mainly low viscosity basalt at slow speeds. This forms lava fields, expanses of cooled basalt that can stretch for miles depending on how much lava the volcano produces. Shield volcanoes aren’t eruptive in the sense that they fling ash and bombs high into the air, but characteristically have slower eruptions in which lava flows out slowly into the area around the magma’s exit point. Before we reached the mountain, we veered off the trail for a few meters, coming to the opening of a cave. The mouth of the cave was about twelve feet high, and from the ceiling dripped canine-like icicles. 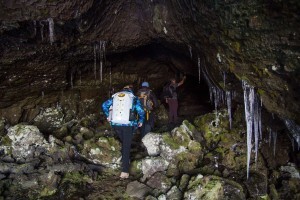 Known as a lava tube, similar caves exist all over Iceland, where flows of lava cool when exposed to cold air, forming a crust around the molten material beneath, which then drains and creates systems of tubes and caverns. 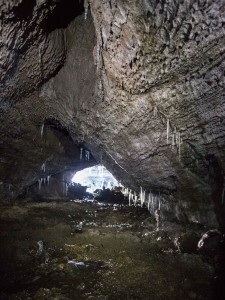 Lava tubes mainly form from pahoehoe lava. It often cools in dripping, beautiful formations that look like frozen liquid, where the flow of the lava is actually observable. The lava tube we explored was relatively short; a few hundred feet from the mouth of the tube, a large boulder had collapsed, cutting off the rest of the passage from the outside world. The floor of the tube was covered in stalagmites made of ice reaching towards the icicles growing from the ceiling above. Stalactites hang from the ceiling and are usually sharp at their point, whereas stalagmites grow from the floor of caves and are usually rounded on top. We spent a minute sitting in silence with our headlamps turned off, listening to the rhythmic drip of melting water and watching the icicles sparkle faintly in the light from the mouth of the cave, appreciating the feeling of being beneath the earth, hidden from the elements, sitting silently in a geologic time capsule. As an avid caver myself, I love this feeling; being underground feels intimate and mysterious, and every cave is truly a unique and special treasure.